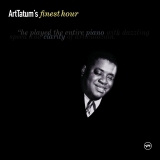 Art Tatum's Finest Hour (this album) (compilation) (2000), The Complete Pablo Solo Masterpieces (compilation) (1991), The Art Tatum Solo Masterpieces, Vol. 1 (compilation) (1992). Sorry, no matches on eBay for "Too Marvelous For Words Art Tatum".